Mr. Frank Sparacino invites all NMDU Members to the 2018 Annual Christmas Party. View the invitation here. Through the pension case settlement, we've secured the pensions for all members and retirees current and retired. We've secured company medical for the NY Times, The Star Ledger, The NY Post and the Daily News through our employers. We saved the death benefit when the medical fund was on the verge of bankruptcy. We're fighting to increase the death benefit by moving it back to the Pension Fund. We added 54 secure new jobs, gained jurisdiction at 8 warehouses and in doing so, increased our dues contributions by $60,000 and pension contributions by $200,000 annually. We've organized the first new shop in over 20 years. There will always be those dissatisfied few who stand on the sideline complaining that all we've accomplished isn't good enough, that we should have done more. They are the ones who seek to divide us, to prevent us from moving forward and who care not about our union but about their own individual personal interests. We will not survive that way. The NMDU is now solid and secure. We have withstood drops in circulation unlike anything we've ever seen, yet we've fought and won to remain strong. There will be tests in the future and we'll need to meet them with unified union strength. We are a union 118 years strong and it's only through unity that we are still here. My platform, going forward, is to continue to protect the jobs of everyone and get us all to a good retirement.....the finish line. Continuing to add new jobs and new members to support and expand our jurisdiction will help us achieve this goal. Protecting the pensions of all union members has and will continue to be my driving force. Keeping people working until they can retire has and will continue to be our driving force. Change will happen but we have a clear direction to get all of us to a secure retirement. The next Executive Board Meeting is scheduled for Tuesday, February 5th 2019 at 6:00PM. For enrollment go to the Tribune website. After January 18th 2019, you can call 844-548-7662 to enroll over the phone up until February 11th 2019. There are no physical forms to enroll in coverage, all is done online or over the phone. If you have questions on benefit booklets, you can also view this information by going to www.tribpubwellbeing.com and click on Benefits Communications to view the open enrollment guides which have the benefit plan designs for your review. Health Care Navigators can help you find the right health plan for you and your family. Click here to view and download the Health Care Navigator listing. If you need in-person assistance to help you understand your options, contact the New Jersey Center for Family Services, their navigators can help you. Bilingual navigators are available. To schedule an appointment with a trained Navigator call 877.9.NAVIG8 (877.962.8448) or 877.922.2377 (for residents living in New Jersey's southern region). Visit the New Jersey Center for Family Services for details. The NMDU Bulletin for 2018 has been uploaded and is available for download on our Downloads page. Just a heartfelt thank you to all the union members who attended the wake of Arthur Velardo Sr (#305) on Thursday, September 13. Your kind words and memories of him brought me such joy and peace. The NMDU is selling a 50/50 raffle. The cost is $10 per ticket. The raffle will be drawn at the annual NMDU Christmas party held at La Greci Staaten on December 3, 2018. The proceeds will go to the benefit of the Union. 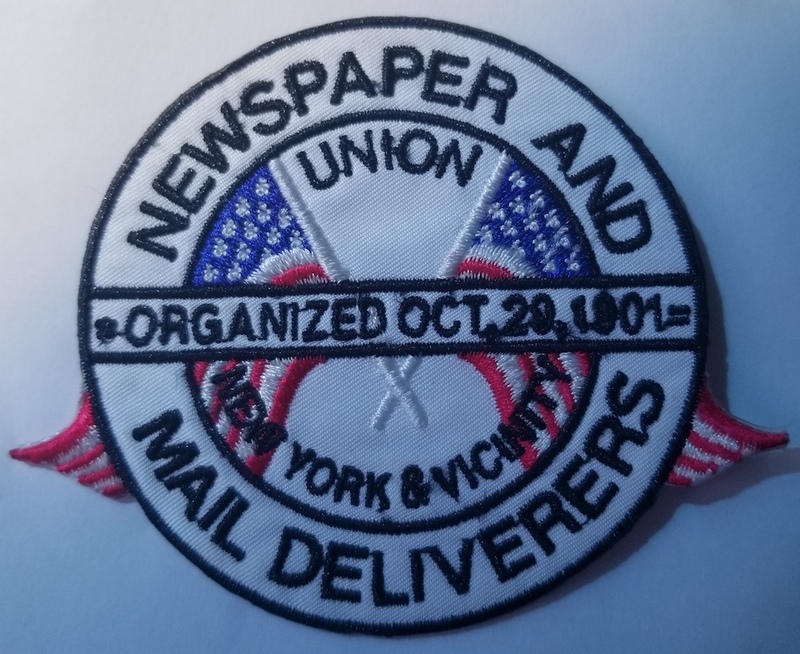 We also have the Union logo patches on sale, the cost is $10 each. Proceeds will go to the benefit of the Union. Anyone interested in a raffle ticket or buying the patch, please contact your Vice President Charles Setteducato at 917.843.4218 or send us an email from our Contact page.